Columbkilles Well is a detached, ground floor, traditional, white-washed cottage, just two miles from the small village of Julianstown in County Meath, near Drogheda in County Lough, and can sleep five people. This all ground floor cottage has a king-size double bedroom with an open fire and an en-suite shower room, a queen-size double bedroom, a single bedroom, a bathroom, a kitchen with a dining area, a utility room and a sitting room with an open fire. Outside there is a shared access drive with off road parking for two cars, a front, enclosed, lawned, stone-walled garden with swings and a slide and a rear, peppled garden with furniture, a barbecue and apple trees. 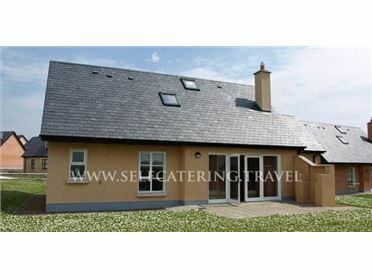 Columbkilles Well is a lovely base for your holiday in Ireland. The small village of Julianstown in County Meath is set on the River Nanny and offers many amenities. The exciting town of Drogheda is just five miles away from Julianstown and offers visitors a selection of restaurants, pubs and shops. Oil central heating with two open fires. Electric oven and hob, microwave, fridge, freezer, washer/dryer, dishwasher, TV with basic Sky, DVD, CD, radio, WiFi. Fuel, power and starter packs of fuel for fires inc. in rent. Bed linen and towels inc. in rent. Travel cot and highchair available. Shared access drive with off road parking for 2 cars. Front, enclosed, lawned, stone-walled garden with swings and slide. Rear, pebbled garden with furniture, BBQ and apple trees. Sorry, no pets and no smoking. Shop and pub 4 miles. Coast 4.5 miles. Note: Due to the small stream nearby, children should be supervised. Note: The neighbours have chickens and there are sheep in the paddock..